LAKE WALES, FLORIDA. Tornadoes had come through here just days before. Blame it on El Niño. Bad weather was a sure threat the whole weekend. While clouds and even torrential downpours interrupted this intermediate CReW camps activities, it would not by any means prevent a successful meet. By mid-morning, Rich our pilot for the camp and Mark had arrived. With the warmup out of the way, we were now officially underway. We had taken the first Otter load of the day, so why not follow up with the first King-Air load of the day. While we had gotten 10,000 out of the first load, the clouds held us to 5,000, even after searching for the ever-elusive hole. King-Air exits are not a CReW jumpers favorite and its a good thing the video was already out of range of this jumpers exit. We built to four, but practicing echelons is always good exercise. The 5,000 ceiling gave way to a brief rainstorm, but with the El-Niño-driven storm-stream, any weather condition is short-lived. The only constant in the weather this weekend was change. It proved to be a nice break for lunch. Laura, our camp coordinator, and David were here now, as were Remo, Edwardo, Frank, and Becky, who was just here on vacation to do RW. We now had sixteen or so players, including Kenn from the 101st Airborne Screaming Eagles, whose CO was kind enough to give him the day off for the camp. They were busy doing accuracy this weekend. Kenn simultaneously achieved his CCR & CCS before the day was over. Mark also got his CCR and CCS this first day. The drop zone helps keep track of who owes beer with the help of covert informants and the little chalk board that reads: Who owes beer. Just go to the beer cooler after the sunset load lifts off and pay your dues. Just leave the goods on the smiley face in the center of the huge indoor packing hangar. Say Kenn, shouldnt that have been two cases of beer? Thirteen made it in for the third jump of the day and fifteen after that. 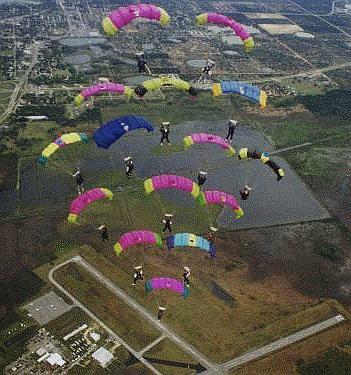 We succeeded in building a sixteen-way by the days end with the help of the drop zone manager Bruce, the only person in the world to have held both a CRW world record and an RW world record simultaneously. He must have brought us some home-town luck as the weather was again moving through. While the clouds provided the most beautiful view from the sky near sunset, their monumental 3-D up-close in-your-face proximity almost ended our dive early. Rich expertly steered the formation down a custom-made sixteen-way-sized hole. Saturday was again plagued early on by the promise - and delivery of rain - cows and flat rocks come to mind. Curious onlookers watched as the restless CRW campers struck up a game of one bounce, a cross between soccer, hacky-sack and volleyball, in the carpeted packing area. Making up the rules on the fly, we amused ourselves and passed the time. 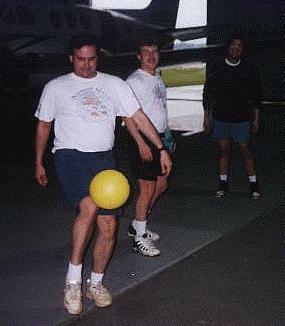 Chuck, Ted and Laura honed their team-juggling skills, while others simply parked it on the floor, obviously weary from their travel schedule. Peter taught a pilots seminar for Chico, Remo, Edwardo and Steve, who piloted his first diamond. With those five on their own agenda, we still had seventeen jumpers, with the addition of John, Mike, Al and Fran, another world record holder. We did manage to build two sixteen-ways that afternoon. Our starburst breakdowns looked great. I got my CCS, having gotten my CCR Friday. Yes, I bought beer. Saturday evening, we discussed business. What shall the standard wing-loading be? .8 - 1.0? With or without gear? Expect some clarification on that soon. A new fee schedule was discussed. Volunteers were solicited for anything that needed to be done. 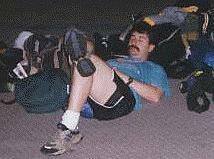 Eric was designated camp coordinator. In other business, a petition and other alleged coercive activity was presented over dinner regarding a row-five wing slot. Ten points for creativity, guys. Notwithstanding, Bryan flew fourth-row wing slot for his first time. Eric was in the fifth-row wing for the first time. Sunday brought more weather delays, but not for long. A short round of the ceremonial one-bounce game summoned the recalcitrant blue sky once more. A blue sky with bright sun was the perfect backdrop for our first formation of the day, a beautiful sixteen-way that Rich presented to the drop zone in ceremonial fashion. Participants were dropping out as the day wore on. Even with the pilot camp over, we had just seventeen. A 3 x 5 box was next. We built that with one stinger. A nice change and a good starburst on that, too. 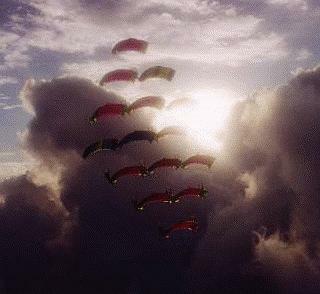 Our next jump was going to be a diamond with a double-starburst with four four-way diamonds. We could not muster enough people, as travel plans required some to leave by mid-afternoon. We did have fifteen, though, and we decided to get Becky her CCR. Rich top-docked her and the rest of us fell in for what turned out to be something of a free-for-all. 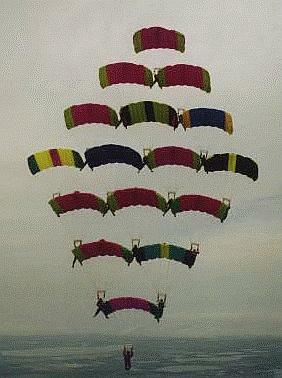 We made nine, and when Steve approached for fourth row left wing, his canopy came around and he aborted. That was enough for everyone else, as altitude was running out. Instability of the whole formation might have been due to smaller canopies asymmetrically arranged near the top. Becky earned her CCS on the next jump. After the nine-way was built, we broke it apart starburst-style, and tried to build it again. We made three. That was the last official jump of the camp. There were five hard-cores who just could not be satiated. As the sun disappeared beyond the horizon, leaving a deep red-orange sky, Rich, Bryan, Eric, Mark and I pulled off seven points, starting with a five-way kite. A fine finish to a very successful weekend. All in all, twelve jumps, six awards, and three firsts. Epilogue:	I visited World Skydiving Center two days later to retrieve photos, and it was windy to beat all. Monday had been the same. Seems we just did get a break in the weather for the weekend.